"Camaraderie" — it's one of the most frequently misspelled words in the English language, and the only word in the lexicon really adequate to describe the relationship between the six characters in playwright Robert Harling's heart-tugging dramedy "Steel Magnolias," now showing at Theatre in the Grove. Done well, this show not only captures the essence of the bond between the cast members; it also forges a bond with the viewers. Director Jason Weed and the Forest Grove crew have provided their stage full of stars with just the right environment to achieve this goal, delivering both laughter and tears on stage and in the audience. The story is set in Truvy's Beauty Shop in Chinquapin, La., and covers almost three years in the lives of six tough Southern women. The ship is run by effusive and maternal Truvy, whose mantra is "there's no such thing as natural beauty," helped by shy newcomer Annelle, who quickly becomes a fixture in the shop, Truvy's family and the group. Throughout the first scene, the other four gradually wander in — wealthy widow Clairee, looking to establish a new identity to replace "mayor's wife," followed by the mother-daughter team M'Lynn and Shelby. It's Shelby's wedding day, so she gets the first appointment, and the bickering between mom and daughter quickly establishes a key theme — diabetic Shelby's quest for independence from a hovering and protective mother. Last to arrive is the perennially irate Ouiser — like Truvy, her heart is gold, but she keeps it well hidden and shows overt warmth only to her poor old dog. Over the course of four scenes, we experience love, marriages (past and present), religion, hope, illness, and death through the eyes of this curious and diverse sisterhood. Leslie Inmon as Truvy plays her down-home, small-town Southerner with just the right touch — never a stereotype, always a tribute to simple, kind women who hold the world together with their open hearts and open doors. As newcomer Annelle, Emma Heesacker cycles beautifully through her character's complex evolution from lost waif to sassy assistant and beyond. Just when we think we've got her figured out, she joins the local Baptists and temporarily drains all of the joy from her character, but by closing she has achieved balance and regained her spark. Robin Reece Michaels' Clairee and Anne Kennedy's Ouiser play the older generation with eccentric Southern élan — Michaels' twin obsessions with football and accessorizing are a complete contrast to Kennedy's almost slovenly attire and faux-misanthropic sarcasm, yet the underlying bond between the two pulses throughout. As M'Lynn, Patti Speight navigates the tricky waters between love and pride in her daughter's beautiful spirit and the fear of a protective mother lioness. Terrified about threats to her baby, she sometimes lashes out in anger, but when Shelby's blood sugar precipitates a crisis, she shows us exactly why she feels she has to express her love through rigid control. Finally, there's Yelena King as the lovely, fragile, yet tough-as-nails Shelby. King is charming throughout, and carries the audience along on her journey to live life to the fullest despite the risks. King's character is often center-stage, but even when she's on the periphery she never stops acting, giving her character a dynamic reality and creating a deep bond with the audience. While the show is set entirely inside the salon, the outside world frequently intrudes through Leslie Crandell Dawes' sound design, and the requisite barking, gunshots, and ringing phones are timed and executed to perfection. As with most Theatre in the Grove productions, the set is authentic, detailed, and functional — the bright checkerboard floor, in particular, sets the stage for the whole atmosphere of the show, and was the first thing I noticed when I walked into the theater. "Steel Magnolias" is one of those iconic shows that, done well, really moves the audience, and Theatre in the Grove's production pays off in spades — you will laugh, of course, but come fully expecting to cry. You will not be disappointed. 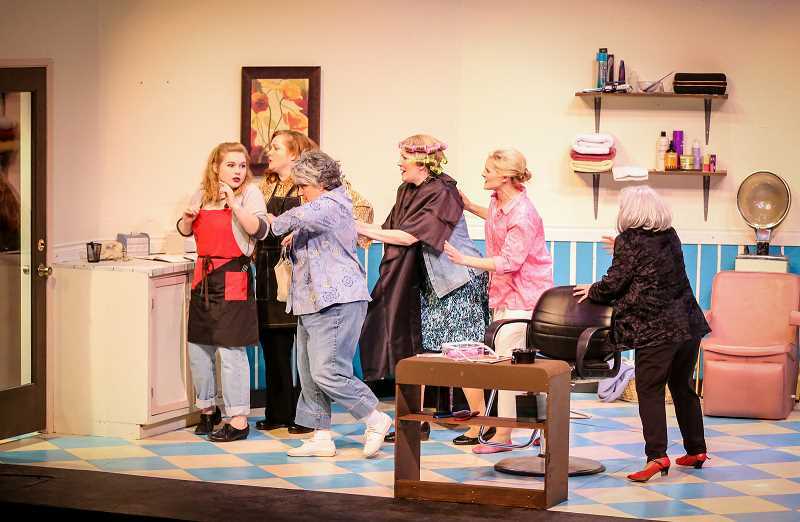 "Steel Magnolias" is playing at Theatre in the Grove, 2028 Pacific Ave., Forest Grove through Feb. 3, with performances Friday and Saturday at 7:30 p.m. and Sunday at 2:30 p.m.